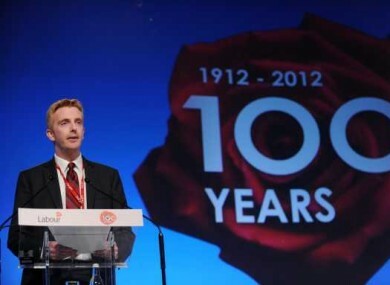 Derek Nolan gave the opening address at the Labour annual conference earlier this year. LABOUR TD DEREK Nolan has expressed his dismay after a group of protesters held a demonstration outside his parents’ home in Galway city today. The Galway Alliance Against War (GAAW) decided to stage the protest outside the family property this afternoon after the deputy informed them that he no longer resided there. Speaking to TheJournal.ie, Nolan said that he had called the anti-war alliance yesterday after he heard of their plans to protest at his parents’ Riverside home. “I told them that I don’t live there anymore and gave them my current address if they wanted to hold the demonstration there. I asked for them to leave my parents out of it,” he said. However, about 25 protesters turned up at the house just after 1pm today. They held a twenty minute demonstration before moving on to the home of another TD. “We left the house,” said Nolan, who explained that he was not going to engage with the group any further today. Spokesperson for GAAW Niall Farrell told TheJournal.ie that the protest was held at Nolan’s parents’ home and not his usual place of residence because it is the address he is registered at. “He knew we were coming,” he added. The anti-war group wanted to highlight complaints it has about a recent Garda raid at Farrell’s home which saw a number of computers and DVDs confiscated. It is understood the raid was in relation to an ongoing investigation into damage caused to an aircraft in Shannon late last year. Farrell claims he is a victim of State harassment and political intimidation because of his anti-war stance. He believes that various protesters, including the Occupy movement, have been criminalised. He has called on his local TDs to raise that matter in the Dáil. He also wants promises that personal information stored on confiscated computers will be safeguarded. Farrell intends to make a complaint to the Garda Ombudsman over the recent raid at his home. The Galway Alliance Against War was established in opposition to the War on Terror. Email “Galway TD dismayed by anti-war protests outside his parents' home”. Feedback on “Galway TD dismayed by anti-war protests outside his parents' home”.